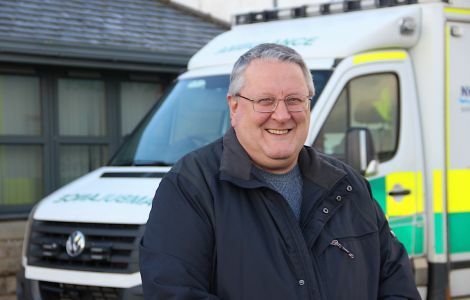 FORMER boss of the Scottish Ambulance Service in Shetland and police special constable Peter Smith retired recently having clocked up a staggering 76 years of combined duty to the two emergency service organisations. The 60-year-old Lerwegian officially retired from the ambulance service after 41 years as an ambulance man, technician and paramedic on 30 September, picking up his medal for long service and good conduct on the way. He received a similar accolade from the police service and five years ago he was presented with the Queen’s Police Medal by the Queen herself after completing 35 years as a “special” prior to his police retirement. 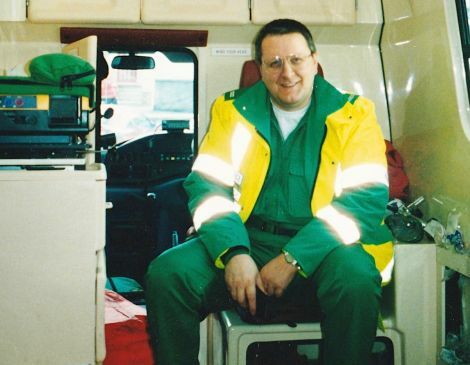 When Peter started training with the Scottish Ambulance Service (SAS) in May 1977, it had only been up and running as a centralised, professional organisation for three years following reorganisation of the health service. It offered ambulance men for the first time a career structure. Since then it has hugely increased in the scope of its medical training and competence not to mention the sophistication of its equipment. On his first shift on 4 July 1977, Peter found himself sharing the porter’s office at the Gilbert Bain Hospital with leading ambulance man (there were no women in the service thenadays) Robert Leask, originally from Bigton, and fellow Lerwegian Bobby Johnson. In the 1970s the ambulance service was very much focussed on accident and trauma cases, with car accidents figuring prominently. All medical emergencies were taken by the on-call doctors of the day. Peter said: “That has changed massively over the years. Most of the ambulance work in Shetland now is medical. We live in a far safer world, for one thing – not all health and safety legislation is madness and lunacy – most of it when interpreted right is very good and has made life an awful lot safer. The service’s two daytime ambulances, which worked nine to five Monday to Friday, were also used to return patients from hospital to their homes or for respite care – a task that is nowadays undertaken by the patient transport service (PTS) of the SAS. At night and the weekend one ambulance is on call. There were four hospitals as the old Gilbert Bain, the Brevik and Montfield were all in operation and liable to call on the ambulances. Things changed over the years, not least the location of the ambulance station, which went from the shared porters’ office to a portable cabin outside the Gilbert Bain (used for 13 years) and then what had been a garage and joiners’ workshop near the hospital gate before moving to the cramped old mortuary at Montfield in 2006. Ironically, it is only now that Peter has retired that the ambulance station has moved to the relatively roomy and luxurious shared accommodation with the fire brigade at Sea Road. Changes that had been progressively coming over the years gathered pace when GPs stopped providing on call cover in 2005. The great emphasis in paramedic treatment these days is early intervention and that theme will only be strengthened in future with paramedics probably having to undergo full-time university training before starting out. “They have proved through studies that outcomes are better and that’s something I’m confident will carry on. The role of the ambulance service will continue to develop and widen out,” said Peter. Peter’s last shift at the ambulance station was actually on 5 August. “I felt a mixture of things. I liked the job – I had to, I did it for 41 years. But things change and you see changes for the good and the better. And you see changes that you think are for the worse and you see changes you do not understand why the change is there. Staff numbers at the Lerwick station have grown significantly in recent years and a couple of years ago six people were taken on at one time, with Peter encouraged to see young Shetland folk are interested in joining. The SAS in 1974 faced a period of great change when it came into being with a career pathway and management structure finally being introduced. The paramedic tier was introduced in the early 90s, and Peter did his training in 1994. “I think that’s when the grey hair started,” he quipped. At one point Shetland had the most paramedics in any station in Grampian, Orkney and Shetland with four paramedics being as many as Aberdeen had and twice as many as Orkney. Local ambulance men jumped at the chance of training. “In terms of staff we were the most intensively qualified station in the north of Scotland I think,” Peter said. “We are now heading towards a path where the ambulance service will not be training paramedics. It will become a university degree, where students will get placements with ambulance services. “It still remains an extremely practical job and you need to have your interpersonal skills. You have got to have understanding; you have got to have empathy. You can be the most brilliant academic in the world but you need to have a practical head around ‘how am I going to get this person that cannot sit up downstairs and into the back of an ambulance’. The big incidents are the ones that have stuck in Peter’s memory such as the Dan Air disaster in 1979 and the Chinook crash in 1986. There were also incidents with klondykers including one where a shuttle lifeboat ran into a baa in Lerwick harbour at night. “One man was lost and the rest airlifted. Peter was on call and got the message that the helicopter was landing 20 crewmen off a klondyker in five minutes. “That concentrated your mind,” he said. Another harrowing job was the air ambulance crash at Tingwall when Peter was called out. On board were Dr Gerald Freshwater, nurse Maureen Polson and pilot Alan Young, who was killed. “The worst one was my brother. You cannot have a darker day than that,” said Peter, recalling the motor accident when his brother Norman was killed. Peter was on the shift when the call came in and the only information was that there had been an accident with a motorbike and a lorry. “My brother had a unique bike in Shetland and as we came up to the scene, I recognised the bike. I knew it was him,” he said. While Peter and Norman both had careers in more than one branch of the emergency services – Norman was later a fireman at Sullom Voe – older brothers Ronnie and Colin followed entirely different career path, Ronnie in education, eventually becoming head of the Educational Institute of Scotland and Colin spent most of his working life in ship agency, retiring as the area manager for GAC, based at Sullom Voe. Peter signed as a volunteer special constable in 1978 in a rather unusual “fast tracked” process. He had been at an incident where his brother Norman was also in attendance as a policeman. The late Albert Leask was there as Norman’s shift sergeant and he had been impressed by Peter’s calm demeanour. He asked Peter if he’d like to join as a special constable and after consultation with Norman – who said “why not?” – the wheels were set in motion and all Peter had to do was turn up to be sworn in by a justice of the peace. Peter managed to combine both careers on the understanding that the ambulance work took precedence. He has seen occasions where he would swap uniforms to go out on a shout with the ambulance and then return to don the police blues again to complete his shift. His last shift with the police was the South Mainland Up Helly Aa in March 2013 where he got a fiery send-off escorting the tail end of the procession on a fine night. “That was something to see,” he recalled. He was on police duty at every fire festival at least once bar Brae and Unst where he was never in attendance. But he also sees signs that the organisation is improving and possibly still has a bit further to go. So now, having hung up his boots from both services, Peter plans to chill and do a bit more dog walking. His retirement started with a Shania Twain concern then a holiday in Fuerteventura in the Canaries with wife Stella and their son Aaron. The couple also have a daughter Stroma. Peter would like to do a lot more travelling and is keen to return to Iceland and Holland, two places he has already visited, and perhaps take the long haul to New Zealand – someday.